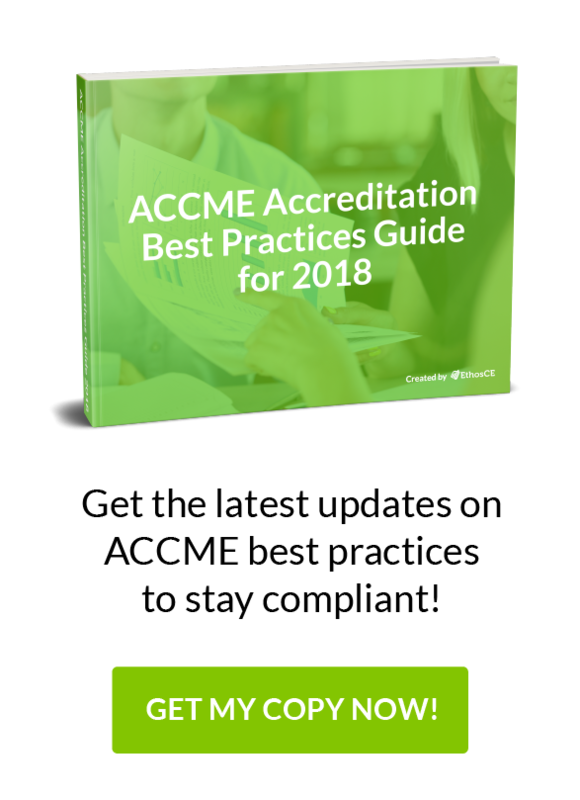 As a CE coordinator, you are well aware that the ACCME accreditation process will be time-consuming, resource-intensive, and perhaps quite nerve-wracking. What you might not know is, even before you’ve filled out the pre-application for ACCME accreditation, there is a period of preparation that will be just as challenging preparation for the final interview process. In this post, we will give you a full overview of the ACCME accreditation process, and provide you with some guidelines to follow to develop a competitive application. First, let’s take a look at the application timeline. The Accreditation Process Timeline: The Pre-Application, Initial Application, The Self-Study Report, and Interviews. The strength of your pre-application will determine whether your association is allowed to move forward in the application process. You will have to present a detailed narrative explaining why your program is eligible for ACCME accreditation. Also, you will need to submit data showing that your program is capable of fulfilling ACCME’s Essential Areas and Elements and Accreditation Process Policies (accreditation requirements) when administering CME activities. That means that you will need to prepare extensive documentation on your activity’s learner participation numbers and activity’s completion rates well before you submit your pre-application. You should have developed a solid method for collecting and analyzing activity data, as well as translating that data into a convincing narrative. Doing this manually is challenging—and risky. Errors in data collection can weaken your application. If you aren’t using a service such EthosCE— which offers PARS, compliant reports and integration with ACCME web services—you will need to be meticulous in combing through the numbers to find the evidence you will need. Step Two: Request the ACCME Pre-Application. Step Three: Compile your data, create the narrative abstract supporting your accreditation eligibility, and submit the pre-application. Step Four: Pay the pre-application fee. Step Five: Begin preparation for accreditation process once your pre-application has been approved. After you’ve submitted your application, ACCME will review your materials and render a decision, usually within four weeks. Your pre-application was just like a movie trailer: you showed ACCME the highlights of your narrative and made the convincing argument they should take a look at the entire story. Now you will have to present a truly comprehensive portrait of your program. You will have to show how every element of your program—such as how user-friendly your LMS is for learners— represents the ongoing fulfillment of your CME mission. That means compiling in-depth activities descriptions and multiple, highly detailed examples of your program’s compliance with each component of the ACCME Accreditation Criteria, Standards for Commercial Support, and other policies. You must show compliance with ACCME’s Criteria 1-3 and 7-12 to receive Provisional Accreditation with a two-year accreditation term. If ACCME finds that Criteria 1-3 or 7-12 are noncompliant, your program will not receive accreditation. You will have up to nine months to conduct the Self-Study Report after the approval of your pre-application. For this part of your application, you will need to present performance-in-practice documentation on two activities completed within the past 24 months. If you are not using a platform such as EthosCE, you will have to manually enter data into the ACCME’s Program and Activity Reporting System (PARS) for the activities that you selected for performance-in-practice review. The activities that you select for review may be ones which you offer through a joint agreement with an accredited ACCME provider, as well as your own. Using the Performance-in-Practice Abstract, you will provide evidence that prove your program is compliant with Criteria 2, 3, 7, 8, and 11, and all other relevant ACCME accreditation policies. You can choose to submit evidence for Criteria 5 and 6, but this is optional and is not taken into account by ACCME when evaluating your application. The accreditation interview is the next step in the application process. A team of volunteer surveyors will conduct an extensive interview of you and your staff, delving into the Self-Study Report and the Performance-in-Practice Report that you’ve submitted. This will be your last chance before the final accreditation process decision-making process begins. ACCME surveyors will review an activity in practice, as well as ask for clarification of any evidence intended to support your application. They will also interview members of your staff to determine if the operation of your CME program is in line with ACCME standards. The goal of the interview process is to verify that your CME mission is realistic and achievable given your current resources and previous successes. The surveyors will report their findings to the ACCME, and the final ACCME decision-making process will begin. The data that you submitted will be analyzed by the Accreditation Review Committee (ARC). The ARC will make a recommendation regarding your application, which is then sent to the ACCME’s Decision Committee. The final decision will be ratified by the Board of Directors of the ACCME, which meets three times each year (generally, in March, July, and November). You will receive your decision by mail. If it is determined that you are eligible for Provisional Accreditation at the end of the two-year term, you will be eligible to apply for reaccreditation. Upon receiving reaccreditation, you will be eligible for Accreditation (with a four-year term) or Accreditation with Commendation (with a six-year term). Now that you understand the process, how do you begin to prepare? Even if you are tempted to “sell” the benefits of your CME program in your narrative, your approach should be more akin to the storytelling style of a documentary. That means a clear, succinct retelling of the development of your CME program that’s free of jargon and hyperbole. Use an abundance of relevant data to make your story impactful. Above all, be transparent about the limitations of your resources and how you will overcome them to fulfill your vision. ACCME is not looking for perfection. They want to see that you can make an honest assessment of your program’s strengths and flaws while developing a realistic plan to respond to the changing educational needs of your learners. Even though ACCME surveyors will give you an opportunity to present data you may have failed to include in your Self-Study and Performance-in-Practice reports, an incomplete report isn’t a great introduction to the ACCME Board of Directors. The data you submit will be the basis of your accreditation decision, and you don’t want errors damaging your chances. While compiling comprehensive activity data will be challenging (and require many hours of review), you always have the option of using a platform such as EthosCE which provides seamless integration with PARS. If you are concerned with making the most of your time during the Self-Study review period, this is a way of taking one more challenging task off your plate. While it might seem like this isn’t necessary to reemphasize, preparing the initial accreditation application is a complicated task, and any missing or incomplete information will be a waste of time (and human resources). Review ACCME guidelines for documentation submission carefully and make sure that your narrative is engaging, but focused on data. You will also need to determine how much of your original vision will be sustainable if the resources that you have available—funding, staff, or your LMS—change. That’s a delicate balance you will need to maintain throughout the accreditation process. At EthosCE, we’ve worked with organizations of every size to help them prepare successful applications. Let us help you focus on developing a strong application, rather than managing technical roadblocks.